Sunday, March 24 at 2 pm. Come to the Loft Cinema to view GENERATION ZAPPED, an award-winning film documentary that investigates the potential dangers of prolonged exposure to Radio Frequencies (RF) from wireless technology; it’s effects on our health and well-being, as well as the health and development of our children. Dr. Magda Havas, BSC., PhD. will make a brief presentation, followed by a be panel discussion. Co-Sponsored by Electromagnetic Safety Alliance and the Pima County 5G Awareness Coalition. Monday, March 25, 6:30-8:00 pm. The OLD FORT LOWELL NEIGHBORHOOD ASSOCIATION is sponsoring a TOWN HALL called "5th Generation Wireless: How Do Changes in Federal and State Policies Impact Our Neighborhood?” Representatives from the City of Tucson, Pima County, a telecommunications industry representative (invited)and Dr. Magda Havas, an EMF researcher and Professor Emeritus with Trent University in Canada will make brief presentations, to be followed by Q & A. This is a free public event to occur from 6:30 to 8:00 pm at the San Pedro Chapel located at 5230 E Fort Lowell Road in Tucson. Space is limited. The event will be filmed and will be moderated by local resident Elizabeth Kelley who directs the Electromagnetic Safety Alliance, Inc. For further information, contact Ms. Kelley at 520 912-4878. Wednesday, March 27, 4:00 pm-5:15 pm. Dr. Magda Havas will be discussing Electromagnetic Hypersensitivity, a growing health public health issue, at the invitation of Kelly Reynolds, PhD., University of Arizona’s College of Public Health. Dr. Kelley is Dean of Community, Environment and Policy at the College of Public Health and is developing a new course entitled “Environmentally Acquired Illnesses” where this presentation will take place. The location is Drachman Hall, Room A120, UA North Campus. Parking available at the metered lot located at Mabel and Martin. For more information, contact Elizabeth Kelley, Electromagnetic Safety Alliance, Inc. at 520 912-4878. Dr. Magda Havas, BSc., PhD., is an environmental toxicologist, EMF researcher and Professor Emeritus at Trent University in Canada, who is known internationally for her research on the adverse and beneficial effects of electrical and magnetic fields and electromagnetic radiation (the non-ionizing band of the Emf spectrum). 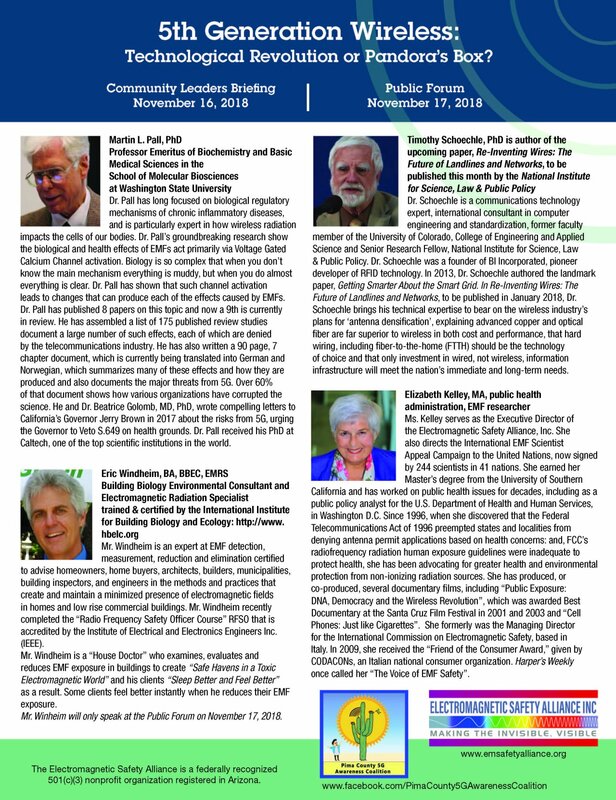 She will present current scientific evidence on the biological changes and adverse health effects of wireless technologies from EMF emitting sources such as baby monitors, laptop computers, smart meters, cell phones, antennas, etc. The proliferation of signals from these technologies has created electrosmog conditions in classrooms, homes and workplaces that is making people sick. Learn what you can do to protect yourselves and your family from EMF health risks by using wireless technologies more safely. Learn how to identify whether your health concerns are related to EMF exposure and - if they are - how to recover your health. Funds will be raised for The Electromagnetic Safety Alliance, Inc. 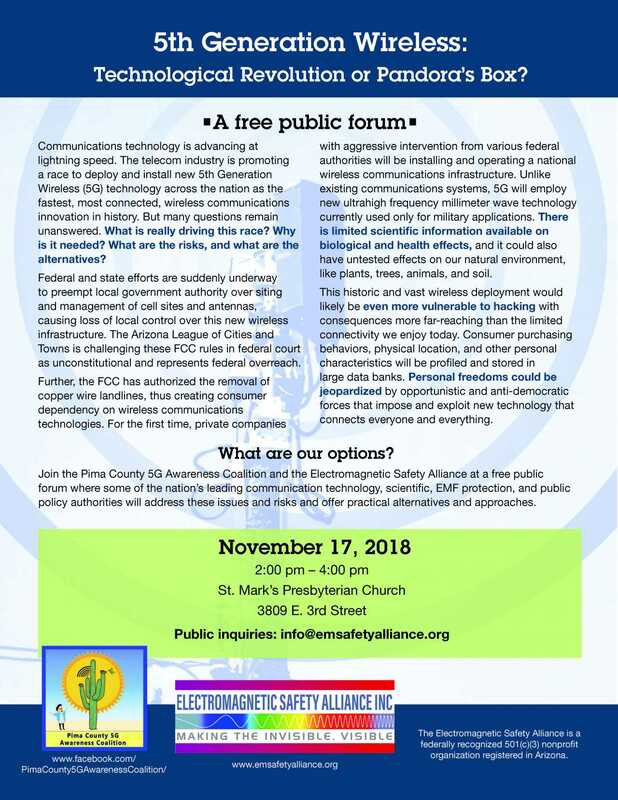 Here are the videos of the speaker presentations made at a Public Forum held in Tucson, Arizona, USA, on November 17, 2018, called 5th Generation Wireless: Technological Revolution or Pandora’s Box, sponsored by Electromagnetic Safety Alliance and Pima County 5G Awareness Coalition. For more information on the program and the speakers, scroll past the five videos. The information on emsafetyalliance.org is provided free of charge. If you find it informative, please consider making a donation. For information, use our contact form.